MacDailyNews Take: When we’re running, there is no more favored Apple product than our Apple Watch Nike+ units. To have a device so small, on your wrist that tracks your run, measures your pace, monitors your heart rate, and plays music so effortlessly is wonderful. If and when the Apple Watch gains the ability to make/receive voice calls and text messages without an iPhone present, it will transcend into insanely great territory! I still LOVE my series 1. After many years of not wearing a watch my wrist feels naked once again on the couple times I forgot to put it on in the morning. Continued waterproofing, getting thinner, MORE WATCH FACES!!!! Cellular for text and calls would be neat, but IF they do that, the speaker needs to be at least 2 times louder IMO. With AirPods you don’t need that speaker. I never used EarPods at all choosing instead to wear a full Bluetooth headset around my neck. Now with AirPods I truly do turn around and go back home if I forget that little white case. I can certainly imagine life without an iPhone if the watch had cell connectivity. Add some sort of wireless interface for the occasional app I may use and the watch suddenly is the center of communications. Apple Watch – over promised and under delivered. Apple Watch is now “simplified”, meaning its true “usefulness” is a narrow and limited set of “functions”. Apple Watch is merely an Apple fanboy identity bracelet. Since you clearly despise Apple, its products, and its “fanboys,” why are you wasting your time (and ours) posting on this site? Wasting my time with the likes of you, obviously. I’m corresponding with men here, you don’t qualify, sycophant. Oooo… I’m so impressed with your manly intellect, Frank. I would guess that you think women fall all over you for your witty repartee, although you don’t seem to think that there are any women here worth corresponding with. It was actually a serious question. If you are convinced that all Apple products are crap and their users are unmanly “fanboys,” why do you bother reading or posting on an Apple site? Apple is not beyond criticism, sycophant. Of course, anyone who claims to be objective, unbiased, and intelligent would know that. Frank it sounds like you’ve don’t own an Apple Watch so you don’t know what you’re talking about. It’s a very useful product that augments the funtionality of an iPhone and AirPods. Picked up my Apple Watch Series 2 three hours ago. I finally caved – not even unboxed yet. Certainly Apple Watch 2 simplified the UI—but it also added GPS and water resistance to 50m. Lack of those two features were deal-killers for me. I haven’t purchased one yet, but now it is most definitely on my wish list. 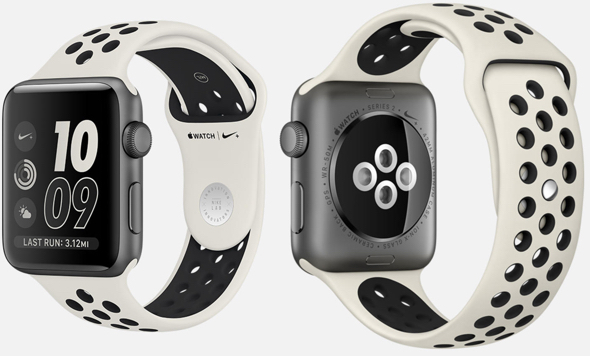 Apple Watch series 2…like all other series, is bulky, boxy, and thick and bouncy, especially when running. As said before, it is a watch designed by 40-somethings for 40-somethings. Apple watch is a compromise! If Apple wants teenagers to wear something on their wrist for the first time, the design is going to have to be sleek, slick, curved, super thin, and colorful. When Ive and Cook finally realize that they live in a bubble and finally deliver a wrist device that teenagers will consider buying, then they will see sales in the stratosphere. The competition is going to figure it out first…it’s just plain common sense and Steve Jobs would have thrown that boxy, thick device across Apple Park into the fountain. Visual design is Apple. This is Cook’s first design and it is visually bad. It doesn’t sound like you own one. “Bouncy” WTF? Thank for sharing,you did very good job. .Apple watches are very nice look. This watch look different then i want buy it.I suggest everyone to use this greatest watch.Keep it up.